From what I understand, the mongols had engineers from China and Persia to handle the siege machinery. I'm mostly curious as if the machinery made by the Chinese engineers was unique and/or superior than the ones seen on the Muslim and Western armies and if their fortifications were ready for them. However, for a variety of reasons, not least the amount of information that is required and whether such concerns are really the focus of the question -- I will restrict this answer to focus mainly on the siege engines and brief mentions of the indicated campaigns. There were mainly 3 types of siege engines: older human-powered and newer ‘counterweighted’ trebuchets. The difference is in the details, of operations and effectiveness. (older) human-powered trebuchet -- 250 men, 90 pound stone, to hit target at 33 yards. ox-bow (kaman-i-gaw) -- no manpower info, but it could propel over-sized arrows and javelins to 833 yards (760 metres!). The explosive force appears to be low-grade gunpowder (copied from the Chinese & improved by the Mongols). Copying & Improving on the Siege Engines: All the numbers are estimates of course and starting from the Chinese (which used gun-powder bombs during Song-Jin wars of 12th and 13th century), the Mongols had copied and learnt to improve on them - not just by themselves, but also from their defeated foes. The catapult was a widely used siege engine by all and each opponent had a different name for trebuchet: called trebuchet or mangonel in Europe, manjaniq by the Muslims, pao in China, and orbu’ur by the Mongols. Unlike the previous campaign of 1219-1221 AD, nominally led by Genghis but, in fact, commanded by Subotai (Bahadur, the brave) -- this campaign by Hulagu was well-planned, hence well-stocked for a full siege. After the Mongol troops “formed seven coils around” the castle, a circuit “nearly six leagues around,” Hülegü surveyed its defenses.94 Some commanders suggested postponing the siege because of the daunting prospect (on which the Assassins were banking) of again becoming snowbound. It was already late fall, fodder could not be found, and grazing was apparently inadequate, as the animals were losing weight; preparations were being made to requisition flour for the troops and fodder for the animals, and to seize all animals for transportation and as rations from all over northern Iran. But Maymun Diz, although well-fortified and difficult of access, appeared vulnerable. The Mongols’ catapults could be placed within range of the defenses, probably within about two hundred yards; if the shots could reach the defenses, they could break them. Hülegü, supported by several of his generals, decided to persist, and the following day fighting began. On the second day of combat, 13 November, the ‘ox’s bows’ went into action, picking off the defending Assassins as they exposed themselves. The catapults needed more time, as they were built (at least in part) from local trees, but with one thousand Chinese artillery specialists on the job, work went quickly; the weapons went into action only six days after the start of construction (12–17 November). Once the parts were ready, teams of haulers stationed at about 300-yard intervals moved them “to the top of the hill.” From there, the catapults began to smash the Assassins’ artillery and walls. Two days later, on 19 November 1256, the Assassin Master surrendered. They reached Baghdad on 22 January 1258. The attack began on the 29th, the artillery broke down the walls and towers of the city, and the caliph surrendered on 7 February 1258. A massacre followed. In their early campaign against the XIA DYNASTY in 1205 and 1209 and against the Jin in 1211–12, Mongol generals had to rely on surprise to capture walled cities, but by 1213 the Mongols were successfully besieging prepared citadels in North China. Chinggis Khan appointed a BARGA (Barghu) Mongol, Ambaghai, the chief of the Mongols’ engineer corps, and he began to train a multi-ethnic force of 500. Source: Encyclopedia of Mongolia and the Mongol Empire (Facts on File, 2004), page 352. 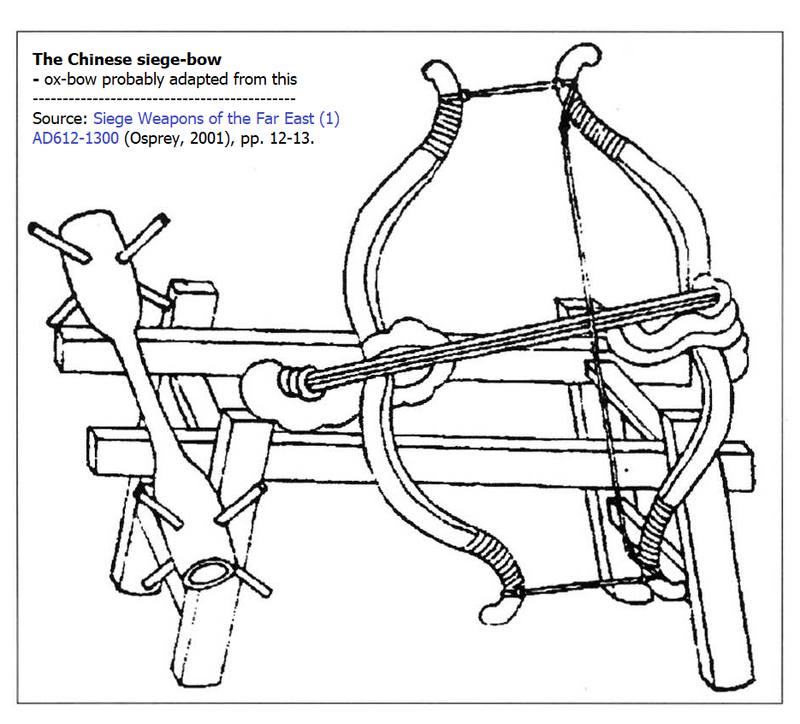 Basic idea of earlier Chinese siege-bow, which Mongols adapted to ox-bow. Mongol siege tactics, not merely siege engines, were among the best in the world for their time. First, the Mongols employed captured Chinese and Persian engineers to design and manage their siege weapons. These cultures had the best siege weapons in the world in the 13th century. These included early cannon and primitive mortars. Second, the Mongols would build their siege engines on site, maximizing their effectiveness, instead of "carrying" them from one locale to another, wearing out both the engines and the men. Third, the Mongols conducted siege warfare as total war. They not only surrounded cities, but stripped the countryside of all supplies so that none of it would ever reach the enemy. This included young men, which were pressed into Mongol service, rather than the defenders' service. They also diverted streams and chopped down forests, etc. Finally, while they had a tendency to slaughter defenders, they made a point of sparing engineers, enabling them to easily capture engineers. They also employed a system of spies, which gave them insights into weaknesses in the enemy high command, political structure, or physical fortification structures. In the case of the Assassins, who had a system of about 100 fortresses,the Mongols captured the strongest one, Alamut, and offered (temporary) clemency to the enemy "grand master" if he would surrender and help them get others to do the same. At the siege of Baghdad, the Mongols breached the enemy walls in five days, and then refused to accept the surrender of the city. Very little is known about Mongol siege equipment, and how it was different from the equipment of other peoples. I tend to agree with Tom Au that the main difference was in tactics, rather then the equipment. But to answer the question directly: yes it was very effective. In fact I know only ONE fortress that the Mongols (Under Batu and Subutai) besieged and failed to take during their invasion of Europe. This is the fortress of Kremenets in modern Ukraine (the fact that they failed to take it is mentioned in Wikipedia, under "Kremenets"). Not the answer you're looking for? Browse other questions tagged warfare weapons mongol-empire siege or ask your own question. What kind of siege weapons were used during Punic wars? What did Golden Horde get out of the alliance with Mamluks?